Vitamin A deficiency is highly prevalent in much of the developing world, where vaccination programs are of paramount importance to public health. However, the impact of vitamin A deficiency on the immunogenicity and protective efficacy of vaccines has not been defined previously. In this article, we show that the vitamin A metabolite retinoic acid is critical for trafficking of vaccine-elicited T lymphocytes to the gastrointestinal mucosa and for vaccine protective efficacy in mice. Moderate vitamin A deficiency abrogated Ag-specific T lymphocyte trafficking to the gastrointestinal tract, gastrointestinal cellular immune responses, and protection against a mucosal challenge following immunization with a recombinant adenovirus vaccine vector. Oral vitamin A supplementation as well as retinoic acid administration fully restored the mucosal immune responses and vaccine protective efficacy. These data suggest that oral vitamin A supplementation may be important for optimizing the success of vaccines against HIV-1 and other mucosal pathogens in the developing world, highlighting a critical relationship between host nutritional status and vaccine efficacy. The World Health Organization estimates that vitamin A deficiency affects >20% of preschool-age children and >10% of pregnant women in >50 countries, including much of Africa and southern and central Asia (1). These are regions where the burden of infectious diseases is high and where vaccination programs may bring enormous public-health benefits. However, the impact of vitamin A deficiency on vaccine-elicited cellular immunity has not been defined previously. Although some clinical and animal studies have shown reduced vaccine-elicited peripheral Ab production and seroconversion in the setting of vitamin A deficiency (2–5), the majority of studies have failed to demonstrate an impact of either vitamin A deficiency or supplementation on vaccine-elicited Ab responses (6). Comparable studies of vaccine-elicited cellular immunity and immunity at mucosal surfaces have not been performed previously. We explored whether vitamin A may be specifically required for the induction of vaccine-elicited cellular immunity in the gastrointestinal tract, as the vitamin A metabolite all-trans retinoic acid (RA) has been shown to be critical for programming B and T lymphocytes to upregulate mucosal homing molecules and traffic to the gastrointestinal mucosa (7, 8). Although vitamin A deficiency has been shown to adversely impact the steady-state accumulation of T and B lymphocytes in the gastrointestinal mucosa (7), the impact of vitamin A deficiency on Ag-specific mucosal T cell responses has not been defined previously. Gastrointestinal cellular immunity may be critical for vaccine-elicited protection against HIV-1 and other pathogens. HIV-1 preferentially targets CD4+ T lymphocytes within the gastrointestinal mucosa (9–12), resulting in chronic intestinal inflammation, breakdown of mucosal epithelial integrity, and translocation of gut microflora into the intestinal lamina propria (13). These processes drive systemic inflammation that contributes significantly to HIV-1 pathogenesis (13). Recombinant adenovirus (rAd)-based vectors are currently being investigated as HIV-1 vaccine candidates and have been shown to induce potent gastrointestinal cellular immunity in mice and rhesus monkeys (14) and to abrogate the mucosal destruction of CD4+ T lymphocytes following SIV infection (15). In this study, we demonstrate that vitamin A deficiency selectively impairs vaccine-elicited gastrointestinal immunity by interfering with RA-dependent upregulation of mucosal homing integrins, blocking the trafficking of Ag-specific T lymphocytes to the gastrointestinal tract, and abrogating protection from gastrointestinal infectious challenge. rAd5, rAd26, and rAd5HVR48 vectors and pCMV plasmids expressing SIVmac239 Gag and Ova have been described previously (16–19). All immunizations were performed i.m. in 100 μl PBS divided equally between both quadriceps. rAd vectors were administered at a dose of 109 viral particles (VP). C57BL/6 (B6), B6.SJL, B6.PL, β integrin−/−, and Ova TCR-I and II (OT-I and OT-II) mice were obtained from The Jackson Laboratory. Vitamin A-deficient mice were generated at The Jackson Laboratory. Pregnant B6 and B6.SJL mice were maintained on a vitamin A-sufficient (4000 IU/kg; Harlan TD96007) diet through day 10 of gestation and then switched to a vitamin A-deficient diet (Harlan TD88407) through weaning. Pups were maintained on vitamin A-replete (20,000 IU/kg; Harlan TD88406), vitamin A-deficient (TD88407), or low vitamin A (400 IU/kg; Harlan TD09775) diets. Serum retinol levels were determined in serum by HPLC at AniLytics Experiments were initiated when animals were 8 wk of age. FTY720 (Cayman Chemical) was administered daily at 1 mg/kg in DMSO by i.p. injection beginning at 48 h prior to immunization. All-trans RA (Sigma-Aldrich) was administered at 250 μg/mouse in DMSO by i.p. injection on days −1 and +1 relative to immunization. Retinyl palmitate (RP) (Sigma-Aldrich) was administered at 600 IU/mouse in vegetable oil by gavage. Mice were immunized i.m. in the quadriceps with 109 VP of each rAd vector. All animals used in this study were maintained in accordance with institutional guidelines, and all studies were approved by the institutional animal care and use committee of Beth Israel Deaconess Medical Center. Lymphocytes were isolated from the spleens and cervical, axillary, and inguinal lymph nodes (LN) of naive OT-I or OT-II mice. CD4+ or CD8+ T lymphocytes were purified from pooled lymphocyte populations by negative selection using immunomagnetic beads (CD4+ and CD8+ T cell isolation kits; Miltenyi Biotec). OT-I CD8+ T lymphocytes were >95% pure by OT-I tetramer-binding assays. CD4+ T lymphocytes were >90% pure by immunophenotyping. Purified OT-I and OT-II lymphocytes were labeled with CFSE (Invitrogen), and 2.5 × 106 cells were transferred to recipient CD45-congenic (B6.SJL) mice by tail vein injection. Mice were immunized i.m. at 48 h following adoptive transfer with 109 VP rAd-Ova. 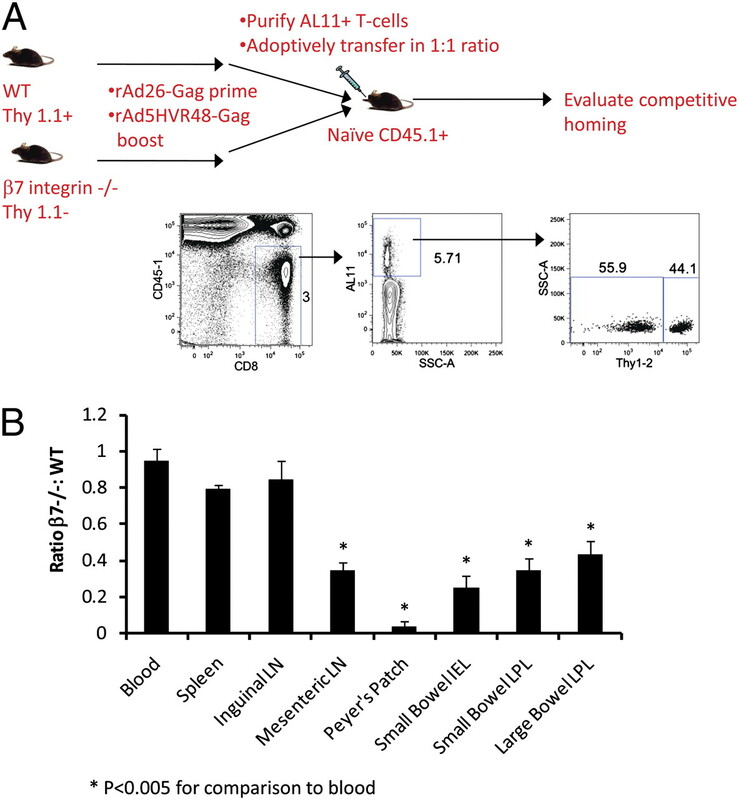 For competitive adoptive transfer studies, B6.PL (Thy1.1+,CD45.1−) and β7 integrin−/− (Thy 1.1−,CD45.1−) mice were primed i.m. at week 0 with 109 VP rAd26-Gag and boosted at week 6 with 109 VP rAd5HVR48-Gag. At day 10 following the boost immunization, CD8+ T lymphocytes were purified from splenocytes by negative selection using immunomagnetic beads as above. The percentage of Gag-specific CD8+ T lymphocytes was determined in each population using Db/AL11 tetramer-binding assays. Gag-specific CD8+ T lymphocytes from wild-type (WT) and β7 integrin−/− mice were pooled at a 1:1 ratio, and 2.5 × 106 total Gag-specific CD8+ T lymphocytes were transferred to each naive B6.SJL (Thy 1.1−,CD45.1+) recipient by tail vein injection. H-2Db tetramers labeled with PE and folded around the immunodominant SIV Gag epitope AL11 (AAVKNWMTQTL) were used to stain lymphocytes as described previously (20). mAbs used for flow cytometry were from BD Biosciences (CD8α-PerCP-Cy5.5 [53-6.7], CD3-allophycocyanin [145-2C111], CD3-PE [145-2C11], [D11c-PerCP-Cy5.5 [HL.3], CD19-PE [1D3], NK1.1-PE [PK136], and CD11b-PE [M1/70]) and eBioscience (CD45.1-PE-Cy7 [A20], CD45.2 allophycocyanin , Thy1.2-allophycocyanin [53-2.1] α4β7 integrin-PE [DATK32], CCR9-PE [CW1.2], and CD103-allophycocyanin [2e7]). LIVE/DEAD Fixable Violet (Invitrogen) and Aldefluor (StemCell Technologies) were used according to the manufacturer’s instructions. Samples were analyzed using an LSRII flow cytometer (BD Biosciences) and FloJo software (Tree Star). Mucosal lymphocyte populations were isolated as described previously (14). Bowel specimens were cleaned, minced, and incubated with HBSS supplemented with 0.2 mM EDTA and 10% FBS at 37°C for 30 min with shaking to release the intraepithelial lymphocytes. Cells were resuspended in 40% Percoll (Sigma-Aldrich), layered over 67% Percoll and centrifuged at 1000 × g for 20 min. Lymphocytes were isolated from the interface. Bowel specimens were then digested with two serial 30-min incubations at 37°C in RPMI 1640 medium containing 5% FBS supplemented with type II collagenase (Sigma-Aldrich) at 300 U/ml with vigorous shaking to release the lamina propria lymphocytes, which were purified on a Percoll gradient as described above. Total RNA was extracted from inguinal LN lysates using the RNeasy kit (Quiagen). Total RNA (2 μg) was used to synthesize cDNA using iSCRIPT cDNA Synthesis kit (Bio-Rad). Gene expression was quantified using TaqMan PCR master mix (Applied Biosystems) with primer probes for Aldh1a1 and Aldh1a2 (Mm00657317_m1 and Mm00501306_m1; Applied Biosystems). Relative expression was calculated using the ΔCT method, and samples were normalized to β-actin. For Aldefluor assays, LN were digested with Liberase TL (0.15 mg/ml; Roche) and DNase 1 (325 U/ml; Sigma-Aldrich) in HBSS for 45 min at 37°C. Remaining tissue was disrupted mechanically. Cells were incubated with anti-CD11c microbeads (Miltenyi Biotec) for 20 min and purified by positive magnetic selection. A purity of 98% CD11c+ cells was routinely attained. Cell suspensions (1 × 106 cells/ml) were incubated for 45 min at 37°C in Aldefluor assay buffer containing activated Aldefluor (StemCell Techologies). Cells were stained with specific mAbs and analyzed on an LSR-II flow cytometer (BD Biosciences). Background Aldeflour staining was <0.5% in the presence of the retinaldehyde dehydrogenase (RALDH) inhibitor diethylaminobenzaldehyde. Listeria monocytogenes-expressing Ova was a gift from F. Frankel (University of Pennsylvania). Mice were fasted overnight and challenged orally with 1010 CFU Lm-Ova in PBS by gavage. At day 3 following oral challenge, livers were harvested and homogenized in 1.5 ml PBS/1% saponin. Serial dilutions were plated on brain heart infusion agar plates, and quantitative colony counts were performed following a 36-h incubation at 30°C. The identity of bacterial colonies was confirmed by PCR for the Ova insert. Statistical analyses were performed with GraphPad Prism version 4.01 (GraphPad Software). Immune responses among groups of mice are presented as means with SEs. Comparisons of mean immune responses were performed using two-sided t tests or Fisher’s exact test. In all cases, p < 0.05 was considered significant. We first evaluated the mechanism underlying the capacity of i.m. immunization of rAd vectors to induce mucosal immunity in mice. Naive peripheral CD8+ T lymphocytes from OT-I mice, which express a transgenic TCR specific for a MHC class I-restricted epitope from chicken Ova (21), were labeled with CFSE and i.v. transferred to naive CD45-congenic recipients (B6.SJL). Recipient mice were immunized i.m. in the quadriceps with 109 VP of a rAd serotype 5 vector expressing Ova (rAd5-Ova). Ova-specific T cell proliferation was evaluated at 60 h following immunization, which represented the earliest time point at which vaccine-elicited T-cell responses could be detected. Vigorous Ag-specific CD8+ T lymphocyte proliferation, as assessed by CFSE dilution, was observed at multiple systemic and mucosal lymphoid inductive sites in immunized animals (Fig. 1A). However, in mice treated with FTY720, a sphingosine-1 phosphate receptor agonist that impedes the egress of T lymphocytes from lymph nodes (LN) (22), vaccine-elicited CD8+ T lymphocyte proliferation was restricted to the inguinal LN draining the inoculation site (Fig. 1A). These data demonstrate that vaccine-elicited CD8+ T lymphocytes were primed locally in peripheral LN but then rapidly acquired the capacity to traffic to distant systemic and mucosal lymphoid inductive sites. Vaccine-elicited CD8+ T lymphocyte priming and mucosal homing marker upregulation. A, Localization of vaccine-elicited CD8+ T lymphocyte priming. A total of 2.5 × 106 CFSE-labeled OT-I CD8+ T lymphocytes were adoptively transferred to naive, CD45-congenic recipients (B6.SJL; n = 8/group) that were untreated or treated i.p. from 48 h prior to immunization with FTY720. Mice were immunized i.m. in the quadriceps with 109 VP rAd5-Ova, and proliferation was assessed by CFSE dilution on day 3 following immunization. B, Vaccine-elicited mucosal homing marker upregulation. Following adoptive transfer and immunization as in A, CCR9 and α4β7 integrin upregulation was evaluated on proliferating CD8+ T lymphocytes at day 3 following immunization. Numbers in black and red represent percentages of total and proliferating OT-I cells, respectively. C, Kinetics of α4β7 integrin upregulation in blood following adoptive transfer and immunization as in B. D, Induction of Aldh1a1 and Aldh1a2 mRNA, encoding RALDH1 and RALDH2, following rAd immunization. C57BL/6 mice (n = 4/group) were immunized IM with 109 VP rAd5-Gag. RALDH expression was determined in inguinal LN by real-time PCR. E, DC aldehyde dehydrogenase activity following rAd immunization. B6 mice (n = 4/group) were immunized as in D. DC were isolated from inguinal and mesenteric LN, and aldehhyde dehydrogenase activity in DC subsets was determined by Aldefluor assay. Error bars are ±SE. *p < 0.05. 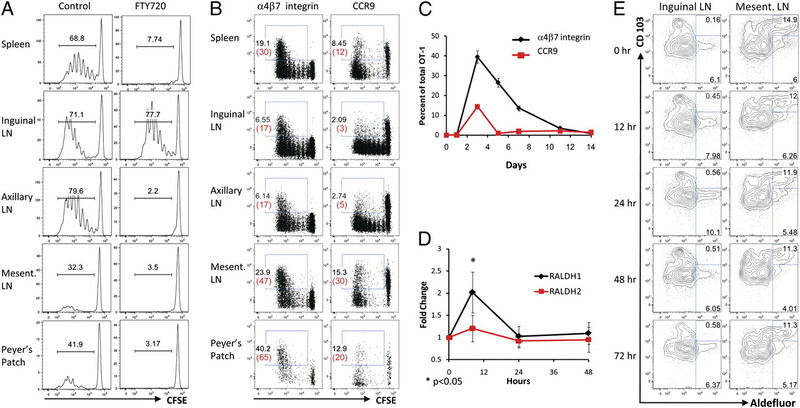 We next assessed the induction of α4β7 integrin and CCR9, cell surface molecules critical for lymphocyte homing to the small intestine (23–25), on vaccine-elicited CD8+ T lymphocytes. At 60 h following immunization, α4β7 integrin was upregulated on 30–65% of responding cells in the spleen, mesenteric LN, and Peyer’s patches (Fig. 1B). CCR9 was initially downregulated during the first three to four rounds of cell division but was subsequently upregulated on 20–30% of responding cells that had trafficked to mesenteric LN and Peyer’s patches (Fig. 1B). Peripheral α4β7 integrin and CCR9 upregulation peaked on day 3 following immunization and then rapidly declined (Fig. 1C), consistent with previous observations (26). Thus, peripheral vaccine-elicited CD8+ T lymphocytes exhibited a marked induction of gastrointestinal homing markers within the first few days following immunization. RA regulates the expression of α4β7 integrin and CCR9 on T and B lymphocytes (7, 8). Although a subset of mucosal dendritic cells (DC) constitutively produces RA (7, 27, 28), peripheral DC can produce RA inducibly when activated through TLR (29). Therefore, we evaluated RA production at the anatomic sites of vaccine-elicited CD8+ T lymphocyte priming and early trafficking. In the inguinal LN draining the inoculation site, i.m. immunization with 109 VP rAd5 induced a transient 3-fold induction of the retinaldehyde dehydrogenase isoform RALDH1 and a marginal induction of RALDH2, as measured by real-time PCR at 8 h following immunization (Fig. 1D; p < 0.05 using a two-tailed t test for RALDH1), consistent with previous in vitro observations (26). This was accompanied by a comparable and transient 1.5-fold increase in aldehyde dehydrogenase activity in inguinal LN CD11c+CD103− DC at 24 h following immunization (Fig. 1E). In contrast, mesenteric LN DC exhibited a high basal level of aldehyde dehydrogenase activity that was restricted primarily to the CD11c+CD103+ subset and was not affected by rAd immunization, as expected (Fig. 1E). These data suggest that vaccine-elicited CD8+ T lymphocytes encountered RA first during local priming in inguinal LN and subsequently following trafficking to mucosal lymphoid inductive sites. We determined the functional significance of vaccine-induced α4β7 integrin upregulation by comparing the anatomic trafficking patterns of vaccine-elicited CD8+ T lymphocytes from WT and β7 integrin-deficient mice. Mice were immunized with a heterologous rAd26/rAd5HVR48 prime-boost regimen using vectors expressing SIV Gag (14) to generate high frequencies of circulating Gag-specific CD8+ T lymphocytes (15–20% of total CD8+ T lymphocytes; data not shown). Peripheral WT and β7 integrin-deficient Gag-specific CD8+ T lymphocytes were then purified and transferred i.v. in a 1:1 ratio to naive recipients in competitive adoptive transfer studies. WT and β7 integrin-deficient CD8+ T lymphocytes expressed distinct congenic markers, allowing their trafficking efficiency to be compared at multiple anatomic sites (Fig. 2A). Gag-specific CD8+ T lymphocytes from WT and β7 integrin-deficient mice trafficked with comparable efficiency to the spleen and inguinal LN, as expected. However, β7 integrin-deficient lymphocytes were selectively impaired in their capacity to traffic to mesenteric LN, Peyer’s patches, and mucosa of the small and large intestine (Fig. 2B; p < 0.005 for each comparison using two-tailed t tests), showing the importance of β7 integrin-dependent mechanisms for vaccine-elicited CD8+ T lymphocyte trafficking to the gastrointestinal tract. Vaccine-elicited CD8+ T lymphocyte trafficking to the gastrointestinal mucosa is β7 integrin dependent. A, Experimental design for competitive adoptive transfers. Naive B6.PL (Thy 1.1+CD45.2+) and β7 integrin−/− (Thy 1.2+CD45.2+) mice were primed at week 0 with 109 VP rAd26-Gag and boosted at week 6 with 109 VP rAd5HVR48-Gag. At day 10 following the boost immunization, equal numbers of peripheral WT and β7 integrin−/− Gag-specific CD8+ T lymphocytes were competitively adoptively transferred to naive B6.SJL (Thy 1.2+CD45.1+) recipients (n = 4/group). Trafficking of WT and β7 integrin−/−CD8+ T lymphocytes was evaluated at day 10 following transfer. B, The ratio of WT to β7 integrin−/−Gag-specific CD8+ T lymphocytes was determined at each anatomic site. Error bars are ±SE. *p < 0.005. We next assessed the impact of vitamin A deficiency on mucosal homing marker upregulation on vaccine-elicited CD8+ T lymphocytes. 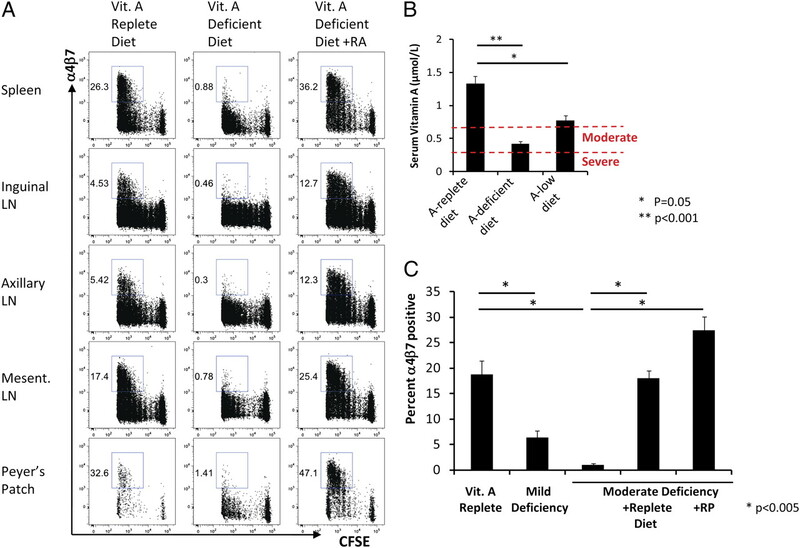 Naive CFSE-labeled OT-I lymphocytes from healthy mice were adoptively transferred to recipient mice that were bred from gestation on either a normal diet or a vitamin A-deficient diet. Following i.m. immunization with 109 VP rAd5-Ova, total CD8+ T lymphocyte proliferation was comparable in both groups of mice at 60 h following immunization (Fig. 3A). However, α4β7 integrin upregulation on proliferating CD8+ T lymphocytes was markedly abrogated in animals that received the vitamin A-deficient diet (Fig. 3A). α4β7 integrin upregulation on proliferating CD4+ T lymphocytes was also abrogated in mice fed the vitamin A-deficient diet (Supplemental Fig. 1). Intraperitoneal administration of RA to animals fed the vitamin A-deficient diet completely restored α4β7 integrin upregulation (Fig. 3A), indicating that RA can fully compensate for the defective induction of mucosal homing markers induced by vitamin A deficiency. Vaccine-induced mucosal homing marker upregulation is abrogated by vitamin A deficiency but restored by RA or oral vitamin A. A, Mucosal homing marker upregulation in vitamin A-deficient hosts. A total of 2.5 × 106 CFSE-labeled OT-I CD8+ T lymphocytes were adoptively transferred to vitamin A-sufficient or vitamin A-deficient, CD45-congenic recipients (B6.SJL; n = 4/group). RA supplementation was given as indicated on days −1 and +1 relative to immunization. Recipient mice were immunized i.m. with 109 VP rAd5-Ova. α4β7 integrin upregulation was evaluated at day 3 following immunization. B, Serum retinol levels were determined by HPLC in mice (n = 8/group) bred on vitamin A-sufficient, vitamin A-deficient, or 400 IU/kg vitamin A diets. *p = 0.05, **p < 0.001. C, Adoptive transfer and immunization were performed as in A using mice (n = 4/group) bred on the indicated diets. Oral vitamin A supplementation was provided either by gavage with 600 IU RP on days −1 and −3 relative to immunization or with a vitamin A-sufficient diet for 1 wk prior to immunization. Error bars are ±SE. *p < 0.005. Mice bred on a vitamin A-deficient diet had a mean serum retinol level of 0.42 μmol/l, whereas mice bred on a diet containing 400 IU/kg vitamin A had a mean serum retinol level of 0.77 μmol/l (Fig. 3B). On the basis of World Health Organization-defined levels for severe (<0.35 μmol/l) or moderate (<0.7 μmol/l) vitamin A deficiency in humans (1), these data suggest that mice that received the vitamin A-deficient diet and the low vitamin A diet exhibited physiologically relevant moderate and mild levels of vitamin A deficiency, respectively. In contrast, mice bred on the control diet had a mean serum retinol level of 1.33 μmol/l, within the normal range for humans (30). α4β7 integrin upregulation on vaccine-elicited CD8+ T lymphocytes was dramatically abrogated in moderately vitamin A-deficient mice but was also partially decreased in mice with only mild levels of vitamin A deficiency (Fig. 3C; p < 0.05 for each comparison with control animals). Vaccine-elicited α4β7 integrin induction was completely restored in moderately vitamin A-deficient mice that received either a normal vitamin A-containing diet for 1 wk prior to immunization or two oral doses of RP, a vitamin A formulation commonly used for dietary supplementation in humans (Fig. 3C). These data demonstrate that clinically relevant levels of vitamin A deficiency and typical dietary supplementation regimens markedly impacted vaccine-elicited mucosal homing marker upregulation. We next evaluated the impact of vitamin A deficiency on vaccine-elicited, Ag-specific cellular immune responses. Control mice and mice with moderate vitamin A deficiency were immunized i.m. with 109 VP of a rAd vector expressing SIV Gag, and Gag-specific CD8+ T lymphocyte responses were evaluated by Db/AL11 tetramer-binding assays at day 14 following immunization (20). Comparable Gag-specific CD8+ T lymphocyte responses were observed in the peripheral blood of vitamin A-replete and moderately vitamin A-deficient animals (Fig. 4A, Supplemental Fig. 2). In contrast, Gag-specific CD8+ T lymphocyte responses were dramatically abrogated in the small intestine and were moderately reduced in the large intestine of the mice with moderate vitamin A deficiency (Fig. 4A, Supplemental Fig. 2; p < 0.005 in by two-tailed t tests). The less dramatic effect of vitamin A deficiency in the large intestine likely reflects compensatory α4β7 integrin- and CCR9-independent mechanisms of T lymphocyte trafficking (31, 32). Importantly, administration of either i.p. 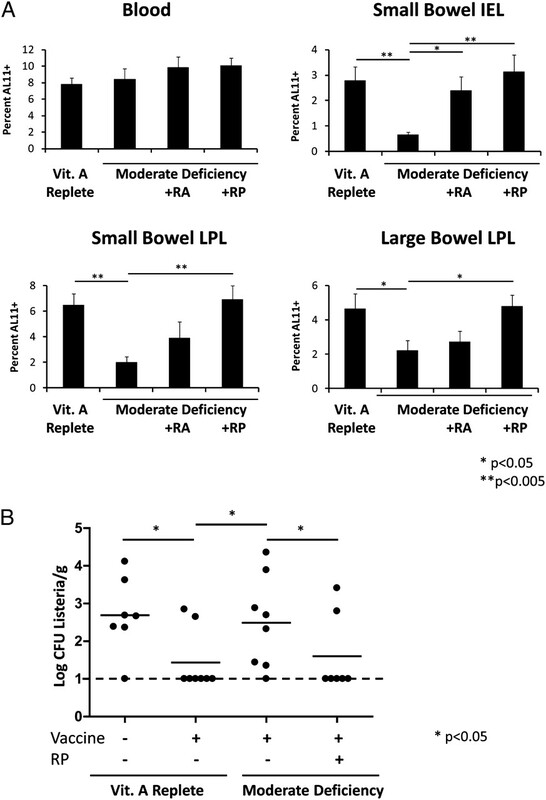 RA or oral RP prior to immunization fully restored Gag-specific CD8+ T lymphocyte responses in the gastrointestinal mucosa (Fig. 4A). Vitamin A deficiency abrogates vaccine-elicited protection from gastrointestinal mucosal challenge. A, Control and vitamin A-deficient B6 mice (n = 8/group) were immunized i.m. with 109 VP rAd5HVR48-Gag. At week 2 following immunization, Gag-specific CD8+ T lymphocyte responses were assessed in the blood and small bowel mucosa by Db/AL11 tetramer-binding assays. Mice were supplemented as indicated with RA at days −1 and +1 relative to immunization or orally with RP at days −3 and −1 relative to immunization. Error bars are ±SE. B, Vitamin A-replete or -deficient CB6 mice were immunized i.m. with 109 VP rAd5-luc-SIINFEKL. Oral vitamin A supplementation was provided by gavage with 600 IU RP on days −1 and −3 relative to immunization. At day 21 following immunization, mice were challenged orally with Lm-Ova by gavage. At day 3 following challenge, liver homogenates were prepared, and quantitative colony counts were performed by plating serial dilutions of the homogenates. *p < 0.05, **p < 0.005. IEL, intraepithelial lymphocyte; LPL, lamina propria lymphocyte. To investigate the impact of vitamin A deficiency on vaccine protective efficacy against a mucosal challenge, we infected control and moderately vitamin A-deficient mice orally with the gastrointestinal pathogen L. monocytogenes expressing Ova (rLm-Ova) (33). Protective efficacy was assessed by determining bacterial loads in the liver on day 3 following challenge to quantitate bacterial translocation from the intestine (34). To evaluate vaccine-induced cellular immune protection, mice were immunized i.m. with 109 VP of a rAd vector that expressed the immunodominant CD8+ T cell epitope from Ova (rAd5-SIINFEKL). Immunization with rAd5- SIINFEKL afforded significant protective efficacy against oral Lm-Ova challenge, as evidenced by a substantial reduction of bacterial loads following challenge of vaccinated mice as compared with unvaccinated mice (Fig. 4B; p < 0.05 by Fisher’s exact test). Importantly, this vaccine-elicited protection was dramatically abrogated in vaccinated mice with moderate vitamin A deficiency (Fig. 4B; p < 0.05) but could be fully restored by oral RP administration immediately prior to vaccination (Fig. 4B; p < 0.05). Vitamin A deficiency remains an important public-health problem in the developing world. Recent meta-analyses suggest that vitamin A supplementation can significantly reduce all-cause and diarrheal disease-specific mortality in infants and children in this setting (35, 36), whereas a benefit of vitamin A supplementation in preventing mortality from other causes such as measles, respiratory diseases, or HIV is not evident (35–37). Moreover, vitamin A supplementation has specifically been shown to reduce the prevalence and clinical severity of gastrointestinal norovirus infections while prolonging viral shedding (38). It is unknown whether specific immunologic mechanisms underlie these effects. In particular, no studies have yet explored whether specific defects in RA-mediated T and B lymphocyte trafficking to mucosal surfaces underlie the clinical outcomes observed in these studies. Clinical studies that have evaluated the impact of vitamin A deficiency or supplementation on vaccine-elicited immunity have primarily focused on seroconversion or peripheral immune responses as immunologic end points and have not evaluated responses at mucosal surfaces (6). These studies have typically been performed using vaccines that have a high rate of peripheral seroconversion such as tetanus, measles, and polio (4, 26, 34, 39–44). A preponderance of these studies has failed to demonstrate a significant effect of vitamin A deficiency or supplementation on peripheral vaccine-elicited immunity. Studies in animal models have shown that severe vitamin A deficiency can impact peripheral B cell development, germinal center formation, and Ag-specific Ab responses (33). However, the impact of vitamin A deficiency on vaccine-induced gastrointestinal immunity has not been previously described in either clinical studies or animal models, despite the critical importance of gastrointestinal immunity for protection against HIV-1 and other mucosal pathogens. Our data define key molecular mechanisms that account for gastrointestinal cellular immunity elicited by rAd vaccine vectors and, to our knowledge, demonstrate for the first time the impact of vitamin A deficiency on vaccine-induced gastrointestinal cellular immune protection. Vitamin A and its metabolite RA potentiate vaccine-elicited gastrointestinal cellular immune responses by upregulating mucosal homing receptors on Ag-specific CD8+ T lymphocytes, likely first in draining LN and subsequently in mucosal inductive sites. These responses are selectively abrogated in mice with moderate vitamin A deficiency but can be fully restored by the administration of oral RP at the time of vaccination. Similar results were seen following i.m. immunization of plasmid DNA vaccines (Supplemental Fig. 3), suggesting the generalizability of our findings for other vaccine platforms. Previous studies have shown that T lymphocytes transiently upregulate gastrointestinal homing markers following activation by a wide variety of antigenic stimuli, including systemic infection or infection localized outside of the gastrointestinal tract (23, 26, 35). We demonstrate that transient gastrointestinal homing marker induction also occurs when T cell priming is restricted to a peripheral lymphoid inductive site following i.m. immunization. Moreover, our data demonstrate that this phenomenon is not part of the intrinsic T lymphocyte activation program but rather is dependent on exogenous vitamin A and RA and therefore adversely impacted in the setting of vitamin A deficiency. Although the RA dependence of T lymphocyte mucosal homing marker upregulation has been well documented in vitro (7, 45, 46), our data demonstrate that vitamin A-derived RA is also strictly required for mucosal homing marker induction in vivo. Our data demonstrate that oral vitamin A supplementation at the time of vaccination is critical for mucosal immune responses and protective efficacy in mice. Although our current studies are restricted to a murine model, the dramatic abrogation of gastrointestinal cellular immunity at clinically relevant levels of vitamin A deficiency and the complete restoration of these responses by oral vitamin A supplementation suggests potential clinical implications of these results. Given the high prevalence of vitamin A deficiency, our data suggest that oral vitamin A supplementation may be critical for optimizing the success of vaccines against mucosal pathogens in the developing world. Moreover, our findings highlight a critical mechanism that links nutritional status with vaccine protective efficacy. We thank F. Frankel, D. Lynch, E. Rhee, H. DaCosta, M. Lifton, V. Toxavidis, J. Tigges, L. Stone, and F. Stephens for generous advice and assistance. This work was supported by National Institutes of Health Grant K08 AI083079 (to D.R.K.) and by National Institutes of Health Grants U19 AI066305, U19 AI078526, and R01 AI066924 and Bill and Melinda Gates Foundation Grant 38614 (to D.H.B.).
. 2009. Global Prevalence of Vitamin A Deficiency in Populations at Risk 1995–2005: WHO Global Database on Vitamin A Deficiency. World Health Organization, Geneva, Switzerland.
. 2000. Retinoic acid and polyriboinosinic acid act synergistically to enhance the antibody response to tetanus toxoid during vitamin A deficiency: possible involvement of interleukin-2 receptor-β, signal transducer and activator of transcription-1, and interferon regulatory factor-1. J. Infect. Dis. 182(Suppl. 1): S29–S36. 1996. Vitamin A deficiency and retinoid repletion regulate the antibody response to bacterial antigens and the maintenance of natural killer cells. Clin. Immunol. Immunopathol. 80: S63–S72.
. 1999. Simultaneous vitamin A administration at routine immunization contact enhances antibody response to diphtheria vaccine in infants younger than six months. J. Nutr. 129: 2192–2195.
. 1997. Enhancement in seroconversion to measles vaccine with simultaneous administration of vitamin A in 9-months-old Indian infants. Indian J. Pediatr. 64: 503–509.
. 2005. Effects of vitamin a supplementation on immune responses and correlation with clinical outcomes. Clin. Microbiol. Rev. 18: 446–464.
. 2004. Retinoic acid imprints gut-homing specificity on T cells. Immunity 21: 527–538.
. 2006. Generation of gut-homing IgA-secreting B cells by intestinal dendritic cells. Science 314: 1157–1160.
. 2005. Peak SIV replication in resting memory CD4+ T cells depletes gut lamina propria CD4+ T cells. Nature 434: 1148–1152.
. 2008. Trafficking of antigen-specific CD8+ T lymphocytes to mucosal surfaces following intramuscular vaccination. J. Immunol. 181: 4188–4198.
. 2009. Immune control of an SIV challenge by a T-cell–based vaccine in rhesus monkeys. Nature 457: 87–91.
. 2007. Comparative seroprevalence and immunogenicity of six rare serotype recombinant adenovirus vaccine vectors from subgroups B and D. J. Virol. 81: 4654–4663.
. 2010. Route of adenovirus-based HIV-1 vaccine delivery impacts the phenotype and trafficking of vaccine-elicited CD8+ T lymphocytes. J. Virol. 84: 5986–5996.
. 2006. Hexon-chimaeric adenovirus serotype 5 vectors circumvent pre-existing anti-vector immunity. Nature 441: 239–243.
. 2006. Modulation of DNA vaccine-elicited CD8+ T-lymphocyte epitope immunodominance hierarchies. J. Virol. 80: 11991–11997.
. 2004. Immunogenicity of recombinant adenovirus serotype 35 vaccine in the presence of pre-existing anti-Ad5 immunity. J. Immunol. 172: 6290–6297.
. 1994. T cell receptor antagonist peptides induce positive selection. Cell 76: 17–27.
. 2002. Alteration of lymphocyte trafficking by sphingosine-1-phosphate receptor agonists. Science 296: 346–349.
. 1999. The role of β7 integrins in CD8 T cell trafficking during an antiviral immune response. J. Exp. Med. 189: 1631–1638.
. 2002. CCL25 mediates the localization of recently activated CD8αβ+ lymphocytes to the small-intestinal mucosa. J. Clin. Invest. 110: 1113–1121.
. 1996. Critical role for β7 integrins in formation of the gut-associated lymphoid tissue. Nature 382: 366–370.
. 1995. Vitamin A and measles vaccination. Lancet 346: 503–504.
. 2007. A functionally specialized population of mucosal CD103+ DCs induces Foxp3+ regulatory T cells via a TGF-β and retinoic acid-dependent mechanism. J. Exp. Med. 204: 1757–1764.
. 2002. Evidence of HIV-1 adaptation to HLA-restricted immune responses at a population level. Science 296: 1439–1443.
. 2009. Toll-like receptor 2-dependent induction of vitamin A-metabolizing enzymes in dendritic cells promotes T regulatory responses and inhibits autoimmunity. Nat. Med. 15: 401–409.
. 2003. Serum retinol levels and the risk of fracture. N. Engl. J. Med. 348: 287–294.
. 2000. The role of thymus-expressed chemokine and its receptor CCR9 on lymphocytes in the regional specialization of the mucosal immune system. J. Immunol. 165: 5069–5076.
. 2000. VCAM-1, but not ICAM-1 or MAdCAM-1, immunoblockade ameliorates DSS-induced colitis in mice. Lab. Invest. 80: 1541–1551.
. 2011. Vitamin A and retinoic acid in the regulation of B-cell development and antibody production. Vitam. Horm. 86: 103–126.
. 2002. Effect of vitamin A administered at Expanded Program on Immunization contacts on antibody response to oral polio vaccine. Eur. J. Clin. Nutr. 56: 321–325.
. 2011. Impact of vitamin A supplementation on infant and childhood mortality. BMC Public Health 11(Suppl. 3): S20.
. 2010. Vitamin A supplementation for preventing morbidity and mortality in children from 6 months to 5 years of age. Cochrane Database Syst. Rev. (12):CD008524.
. 2010. Micronutrient supplementation in children and adults with HIV infection. Cochrane Database Syst. Rev. (12): CD003650.
. 2007. Vitamin A supplementation has divergent effects on norovirus infections and clinical symptoms among Mexican children. J. Infect. Dis. 196: 978–985.
. 2003. Effect of Vitamin A supplementation on the immune response to measles vaccination. Vaccine 21: 2418–2420.
. 2000. Adequate immune response to tetanus toxoid and failure of vitamin A and E supplementation to enhance antibody response in healthy children. Vaccine 18: 2979–2984.
. 2000. HIV-specific CD8+ T cells produce antiviral cytokines but are impaired in cytolytic function. J. Exp. Med. 192: 63–75. 1997. Vitamin A supplementation. Lancet 350: 1031–1032.
. 1999. Integration of vitamin A supplementation with the expanded program on immunization does not affect seroconversion to oral poliovirus vaccine in infants. J. Nutr. 129: 2203–2205.
. 1992. Depressed immune response to tetanus in children with vitamin A deficiency. J. Nutr. 122: 101–107.
. 2003. Selective imprinting of gut-homing T cells by Peyer’s patch dendritic cells. Nature 424: 88–93.
. 2005. Reciprocal and dynamic control of CD8 T cell homing by dendritic cells from skin- and gut-associated lymphoid tissues. J. Exp. Med. 201: 303–316.